While playing fast for the sake of it is probably not a worthwhile pursuit on guitar, once you’re over 17, it’s nice to have a little speed on-tap for those moments when the emotion of the piece requires it. Playing chromatic scales with a metronome for hours on end to build speed never really did it for me, and if it doesn’t float your boat either, you’ll be pleased to know that there are plenty of other ways to tweak your playing for a quick injection of speed, or simply to get a better tone and more consistent attack. Have you ever checked how much pressure you’re applying to each fret when you play single notes? No, neither had I, but it’s very revealing and will also improve your tone. Pick any note on the fretboard and rest your first on it as lightly as you can. Start picking the note while gradually applying pressure until you reach the point where the note is sounding cleanly. This is the ideal pressure point and if it feels strange, you might have just found out that you’re applying a little too much pressure when you play, which will inevitable slow you up. Repeat the process with each finger on different strings and you should notice a difference in your playing; this is also something you can do when you pick up the guitar as part of your practice routine. This is a great little exercise to develop a consistent string attack. Plug your guitar into anything with a volume meter – most effects pedals or rigs have one – and watch how much your pick attack varies in volume. First try to get all your picked notes to the same volume to have a baseline to work from. Next, try accenting different notes while maintaining the others at the baseline volume you established (you might want to mark this on the volume meter). One of the most challenging areas of fast playing is mastering string-switching, or finding ways to get around it. After binging on Troy Grady’s Cracking the Code videos, especially the Eric Johnson ones, I found that side-stepping the whole thing by changing strings on either a hammer-on or a pull-off dramatically increased my fretboard speed. You see, being able to change strings quickly and effectively has little to do with brute fretboard speed (metronome + chromatic scale), it’s a mechanic that facilitates the process, the secondary effects of which increase your speed. It took me the best part of a decade to realize that picking notes was never the fastest or best way for ME to play single-note lines. I’d always found legato playing came very naturally to me but kind of dismissed it as ‘too easy’, and went in pursuit of a great picking technique. The fact is that my legato technique will always be better and far more natural, so you might want to ask yourself what the best way for you to play fast is. Satch is a great example of this; you won’t see him picking at high speeds because it’s probably not one of his strengths, preferring instead to maximize his legato technique, which is a stand-out aspect of his playing. 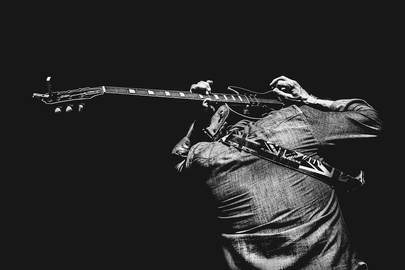 The best licks to practice fast playing are, of course, your own. When you try to learn fast licks by other players, to a certain extent you’ll have to adopt their picking technique and mechanics to pull them off. While you’re building speed, it’s probably better to cut out those unnecessary dynamics and concentrate on playing things you play, just faster. Another useful source of practice licks is not scales but scale fragments. Take three or four notes from any scale pattern you know and practice playing them fast; here is where you can incorporate all the above tips: finger pressure, picking volume, string changing and legato while keeping it as musical as possible.